Twenty years into the epidemic, the HIV/AIDS virus ravages on: in 2006, an estimated 39.5 million people in the world were living with HIV, 4.3 million were newly infected, and 2.9 million AIDS-related deaths. Of the deaths, 2.1 million occurred in sub-Saharan Africa. As for new HIV infections, South Africa alone is estimated to have 1500 ... per day. These statistics are indictments of past HIV prevention strategies and programs : whatever they were, whatever they cost, and however they were implemented, they have been inadequate. The question then becomes: what strategy changes should be adopted? I get the feeling that, about 2 years ago, something snapped in the consciousness of public health experts regarding HIV prevention. Enough was enough. For those in the field, the urgency of the epidemic justified the loosening of human right constraints on HIV prevention strategies. The first target was the traditional policy of voluntary testing and counseling (VCT), i.e. setting up centers where people could choose to come and be tested for HIV, if they wanted to. Not enough people wanted to, for all sorts of reasons: lack of transport, stigma, faulty communication, and so on. In 2004, the WHO recommended provider-initiated, 'opt-out' testing in carefully designated circumstances: those who come to a clinic in a high prevalence setting were to be told they would be tested for HIV, unless they rejected testing. The CDC soon followed suit with similar policies. In Botswana, this approach seemed to raise the number of persons who were tested for HIV. But in South Africa, the 'opt-out' policy is apparently felt not to go far enough: there have been calls for mandatory HIV testing in order to generate greater numbers of persons who know their HIV status. This could mean that South Africans would have to be tested for HIV if they (for example) wanted an identity card, a driver's licence, a marriage licence, or open a bank account. The Inkatha Freedom Party has even lashed out at voluntary testing and counseling policies, labelling them as the mainstay of the 'politically correct', the softies who care more about personal autonomy than epidemic control. VCT, in other words, is for pussies. Not everyone is buying it, of course. Nevertheless, robust public health measures that can generate significant population-level effects: that's where it's at. Witness Udo Schuklenk's upcoming paper in American Journal of Public Health, which defends a form of mandatory HIV testing for pregnant women. Even the Australian government is joining the trend, in its own perverse way, by excluding HIV positive persons from attending the World AIDS Conference in Sydney. Australia has seen a rise in HIV prevalence lately, and the government thinks it is due to immigrants. Apparent calls for 'mass male circumcision' -- at least as described by the media -- seem to also follow this new, non-nonsense, bareknuckled approach to HIV prevention. Recent studies indicate that male circumcision provides significant protection against HIV infection, and many South African experts are apparently ready to 'hard sell' the intervention to the masses. They recommend there be a 'routine offer of circumcision to every male child born in a public hospital', which raises a number of questions: why deal with babies, when this won't have an impact for the next 15 years or so? How will communities respond to such aggressive policies? Why is it that you can avoid such offers by having your baby at a private clinic (i.e. being wealthy)? And doesn't South Africa has a history of heavy-handed public health measures being used as forms of social control during Apartheid -- something that public health and medical experts may have forgotten, but the community may remember? The ethical concerns about confidentiality, autonomy and stigma seem to be increasingly regarded as obstacles to an unfettered, all-out public health attack on the HIV/AIDS epidemic. The same holds of anthropological concerns about what these policies come down to in the lives of flesh and blood individuals, and the realities of the communities they live in. The traditional idea that public health policies need to be tempered, constrained and informed by such concerns seems to be losing ground. Will these 'tough love' approaches to HIV prevention turn the tide? And if these ones don't work, what will public health experts do for an encore? Tuberculosis has a strange history. It is an ancient disease: Hippocrates long ago identified phthisis, the Greek term for tuberculosis, as the most widespread disease of his day, and over the centuries the disease has killed millions. But it is also curable. Albert Schatz, a graduate student at Rutgers, isolated the antibiotic Streptomycin in 1943, which has proved effective against tuberculosis in treatment programs around the world. Ideally, that should have been the end of TB's story as a major source of mortality. It has not turned out that way. Effective treatment of TB requires taking the current drugs of choice (Rifampicin and Isoniazid) for a number of months, which patients are not always able to do, particularly in resource-poor countries, where drug supply chains, availability of health workers, funding of tuberculosis programs, and even the drugs themselves may be unreliable. Treatment interruption is largely responsible for the worldwide rise of multidrug resistant or MDR-TB, and of extensively drug resistant or XDR-TB. The upsurge of drug resistance is obviously a step backwards: it evokes the pre-1943 days, the days before drug treatment, the days of sending patients to sanatoria for fresh air, and in the last resort, submitting them to ghastly surgical interventions. The newspapers, television and blogs have been filled this week with the story of Andrew Speaker, the lawyer from Georgia who took an international flight from Prague to Montreal after having learned from the Centers for Disease Control and Prevention that he is suffering from XDR-TB. 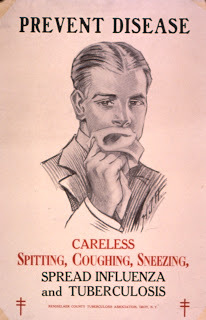 Despite his apparent low infectiousness (having tested negative on skin tests, not being symptomatic), despite the lack of one known case of contracted active TB within an aircraft, and despite physicians not expressly forbidding him to fly, Mr. Speaker is largely being treated as a kind of bioterrorist, a fugitive, or a 'rascal', as this talking head (Dr. William Schaffner) on CNN video refers to him. On another CNN fear-inducing clip, one of Speaker's fellow passengers talks about her concerns about getting TB and possibly tranmitting it to family members by 'eating and drinking with them.' The CNN anchor does nothing to correct the misconception. Meanwhile, every expert and his dog is lining up to justify strict quarantine. On a brighter note, NPR gives a nuanced view of the case and provides useful factoids to help prevent further stigmatization of TB patients. Let's see how the other half -- in the southern hemisphere of our planet -- lives with XDR-TB. While Speaker was flown to a high-tech TB facility in Denver on private CDC jet, things look a bit different down in Brooklyn Chest Hospital in Cape Town, South Africa. There, XDR-TB patients can only get a hospital bed after many months, if at all, and MDR-TB patients fare no better. This means that there are many identified (and who knows how many unidentified) MDR and XDR-TB patients out and about in the Cape Town community. Whereas in America this would probably lead to mass hysteria, local health providers in South Africa take a pragmatic approach: since isolation is not feasible, these patients may have to be treated within community settings, and ways will have be devised to prevent them passing on infection to others. "We need to now as a department and as a society come up with the best and most humane manner to care for untreatable infectious patients. Maybe put infection control measures in place at community level and do lots of health education so that patients can be with their families and loved ones," says Dr Marlene Poolman, Deputy Director for TB Control in the province. Watching Andrew Speaker on Good Morning America is about as close as the vast majority of Americans are ever likely to get to an XDR-TB patient. Other countries can't radically separate healthy citizens from such 'rascals', because they don't have the resources. Still, Speaker is a victim just like any patient with drug-resistant TB: a victim of poorly funded and implemented primary TB programs around the world, the rich spawning ground of drug-resistant strains. Perhaps now that an affluent citizen of the North has been struck by a disease far more prevalent in the impoverished South, more attention will be paid to global TB control. Or maybe we will just speculate and sermonize about his rascally behavior.